Our community values our Parks & Recreation. Several years ago there was the possibility of a reduction of service. This simply was not going to happen. Our community stepped forward and made it clear that this would continue to be one of the top priorities of our city. It was Jim Baldes, Chair of the Parks and Recreation Commission, who stepped up and created a non-profit organization that would insure the future of these programs. Jim continues to inspire Dixie to volunteer and fund projects for this organization. These programs help to promote a healthy active lifestyle in our community. Numerous people and families benefit from these programs and will continue to benefit for many generations to come. 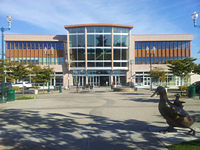 In 1996 Dixie was named the first Volunteer of the Year for the City of University Place. 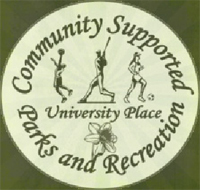 For many years the city coordinated the resources for volunteers in University Place. Our citizens responded and volunteering in our community became so successful that it was evident that we needed to do something more. It was a natural transition when valued long time city employee and volunteer coordinator Diana Harmon retired. Roger Gruener encouraged Dixie to become involved in a group of citizens that got together and the University Place Volunteer Center was established with Team Insurance donating the original office space for them. Be sure to check out their website for the new office location and volunteer opportunities. 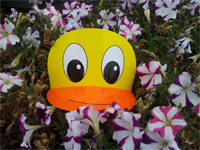 On the first Saturday in June our community gets together for the annual Duck Daze celebration. The event began almost 15 years ago when Terry Reim recruited Dixie to be a co-founder of the University Place Farmers Market. They felt we needed to bring our community together. What better way to celebrate than with a parade and celebration in our beautiful main street, Bridgeport Way, that the city had just completed. Then there was the theme, spring showers are almost gone and we are heading into summer so let's celebrate the end of the rainy season. What better mascot than ducks! This is now an all day event with a parade, food, entertainment and many vendors. Chambers Bay will be home to the 2015 US Open. We are all excited that people from all over the world will now know just how special University Place is. Only a few years ago, we were inspired by good friend, Jim McCaffree, inviting us to be a part of a playground that would be built at this location. Jim has a passion for children and it was a natural Dixie would want to be part of this project. Children at play bring laughter and joy to a world that sometimes needs it more than ever. Being involved in the Tahoma Audubon Society we were excited to provide the funding for the bird entrance to the park, in honor of Thelma Gilmur. Outdoor play is enjoyed by all children with a beautiful view of the Puget Sound. Stop by sometime and take part in "one of the best days ever." Adriana Hess Wetland Park located at 2917 Morrison Road West in University Place is the home of the Thelma Gilmur Education Shelter. For many years Dixie has volunteered in this park and currently serves on the Adriana Hess Wetland Park committee. Along with volunteering Dixie also has a passion for education. Thelma Gilmur, a teacher and long time conservationist, was the inspiration for us to fund the construction of this outdoor shelter. It is a beautiful native park and we encourage you to take some time to stop by and enjoy what nature has to offer. Our goal was to provide a space to encourage outdoor nature education with emphasis on the theme of: "No child left inside." Many years ago our community created a vision of a town center that would include emphasis on providing a community gathering place. One of the key components would be centralizing our library in such a way that it would become "the heart of our town center." Supporting educational activities has always been a priority to Dixie. Our community also has always made education a priority. It was long-time treasured friend, Ruthann Reim-McCaffree, who was the inspiration for Dixie to provide the funds necessary for the tables and chairs in the children’s area of the library. Be sure to stop by our library to see what wonderful services they are offering.